RVing with family has never been more relaxing with all of our front living space fifth wheels for sale! Many of our options of fifth wheels come with this particular luxury, including various Keystone RV fifth wheels that will sleep anywhere from 4 to 9 people. Front living spaces are complete with the space you need to relax comfortably during vacations when the weather doesn’t cooperate. Instead of being stuck in a tent, you have the option to stay indoors while still camping. Whether it’s raining, overheating, or snowing, you’ll always be comfortable in these RVs. The living spaces give you exactly what they say- a space to live in that will help give you more relaxing moments when your whole family is in the RV. As a front living space fifth wheel dealer, we give you different options to choose from. Each living area is different, which gives you more choices and freedom to get exactly what you’re looking for in an RV. 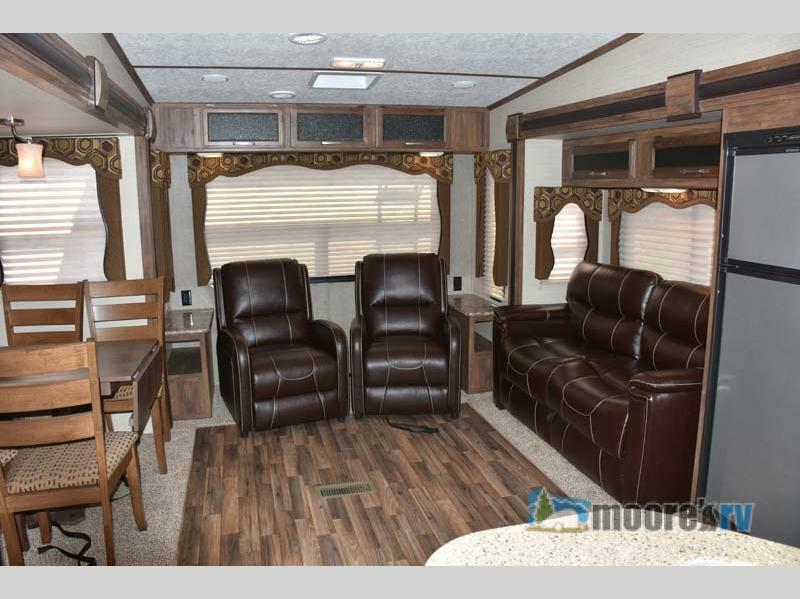 Sometimes the entertainment center is a must-have, or maybe you’re looking for an area with a table and chairs to sit down and play a fun card game with your relatives and friends… Moore’s RV can help you find exactly what you want to give you the best experiences in your RV. Enjoy this living area with a fully furnished entertainment center! Hardwood floors give an RV that extra needed feature to keep it looking sleek and finished, which helps give the front living space an extra boost on looking just as spacious as it feels. Different models provide you with either a couch or two leather chairs, which make the space more comfortable and adds a little bit more of home to the long vacations. 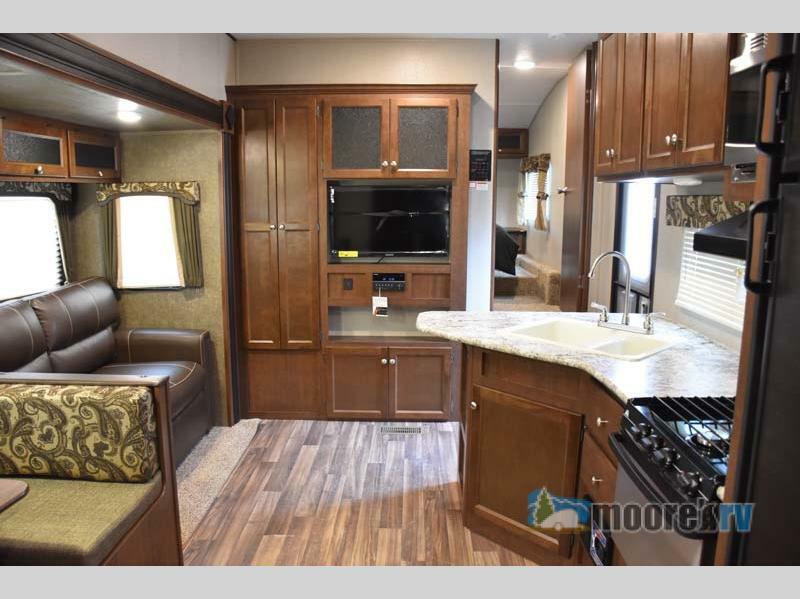 Moore’s RV has a fantastic selection of front living space fifth wheel RVs. You’ll never want to leave one of these spacious fifth wheels again! Vacations will never be the same, as your family is close enough to spend quality time together, while still having the space you need to not feel like you’re all cramped. If you have any questions about these specific fifth wheels, please don’t hesitate to contact us, we’re always more than willing to help you out. Or, you can always stop by and see us if you want actually see some of these amazing options for yourself. A fifth wheel has never been more spacious and more perfect for you and your family.